Tokyo, July 21, 2011 - SANYO Electric Co., Ltd. (SANYO), a world leader in rechargeable battery technology, is pleased to announce its new “eneloop mobile boosters (KBC-L54D and KBC-L27D)”, lithium-ion batteries with USB power ports which have higher capacity than previous models (KBC-L2BS and KBC-L3AS). The new mobile boosters can not only recharge the latest smart phones and tablet PCs such as iPhone and iPad series, but they can also power various gadgets with USB power ports. Along with this, the higher output makes it possible to charge gadgets more quickly. The new eneloop mobile boosters will go on sale on September 8, 2011 in Japan only. SANYO will continue to develop and expand its ‘eneloop universe’ product series while emphasizing lifestyles that value reusing resources, allowing people to enjoy the conveniences the series offers, as well as a sustainable energy lifestyle. KBC-L54D with 5400mAh and KBC-L27D with 2700mAh. Generally speaking, smart phones and tablet PCs which are growing in popularity need more power than conventional cell phones. 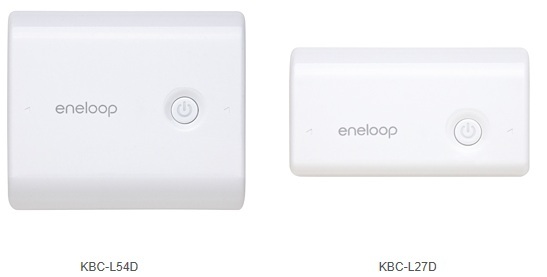 The KBC-L27D with 1.0A, twice the output of the previous model (KBC-L3AS), is suitable especially for smart phones for efficient recharging in a shorter time. 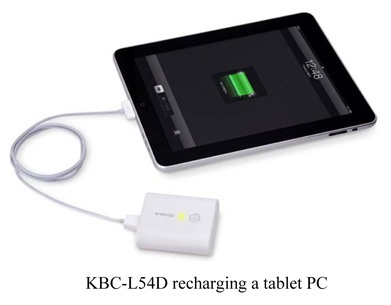 In addition, the KBC-L54D with 1.5A, one and a half times the output of previous model (KBC-L2BS) is suitable especially for tablet PCs which need a high power current. The models can be recharged through a PC's USB power ports via a USB cable, as well as through a dedicated AC adaptor. In addition, the attached USB cable which is USB-A type - USB-micro-B type can also be used to supply power to gadgets such as smart phones with a USB-micro-B type port. Furthermore, the 3 color LED light clearly indicates the remaining capacity of the battery with green, orange and red. ‘eneloop’ originated from the concept of “looping energy”. Since their release in November 2005, ‘eneloop’ nickel-metal hydride rechargeable batteries have received high market appraisal for their cost-effectiveness and environmentally friendly features. The batteries come pre-charged like a dry cell, and are economical and environmental as they are able to be recharged for repeated use as well as recyclable at the end of its lifecycle. In total, over 170 million ‘eneloop’ batteries have been shipped to more than 60 countries worldwide (as of the end of May, 2011). In 2006, SANYO began developing the ‘eneloop universe’ products, by expanding the ‘eneloop’ concept with new products such as the ‘eneloop solar charger’ and the rechargeable ‘eneloop kairo’ hand warmer. In 2007, SANYO released the ‘eneloop mobile booster’ series of products for use as supplemental power sources and emergency chargers for various mobile devices. The eneloop mobile booster series is becoming more and more popular as smart phones become increasingly common.